In a book Brenda just created, she relates the stories of these women after going on a retreat in the “Holy Day Inn” at Camp Hardtner (the Diocese of Western Louisiana’s camp). “I began writing and playing,” she writes in Living Water. “Words poured out. I was playing chords that I didn’t know, just finding things on the guitar…” Several of the songs from that time at Camp Hardtner became, along with an earlier one she’d written entitled “Rock My Baby Jesus,” the actual seeds of the program for “Women at the Well” that she and Joshua now perform at churches, schools, restaurants, mission houses, informal parties, and in living rooms throughout the U.S. The first presentation of “Women at the Well” was performed at the Solomon House, an outreach mission in New Iberia, Louisiana for which I was director many years. It followed my ordination to the Diaconate, and Brenda refers to me as the “midwife” of the collection of songs and an encourager of her “creative recovery.” I’m honored by her acknowledgments and by a poem of mine, “Ground of Your Beseeching,” that she and Joshua now open with when they perform “Women at the Well.” In Living Water, she describes it as a call to ministry for all — women, men, and youth. The stories of women in the New Testament that inspired Brenda range from the adulterous woman whose life was saved and turned upside down following her encounter with Jesus to a favorite of most audiences, “Martha’s Blues,” a blues song that she sang in a concert to raise money for the Order of St. Mary at Sewanee, Tennessee where I reside part of the year. 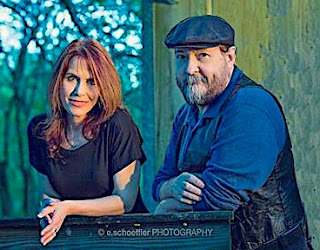 Brenda also tells the story of losing her hearing in one ear and how this sensorineural hearing loss has not kept her from singing and recording, “processing some signals differently,” she explains. It’s a moving story that shows Brenda’s tenacity and her call to ministry. 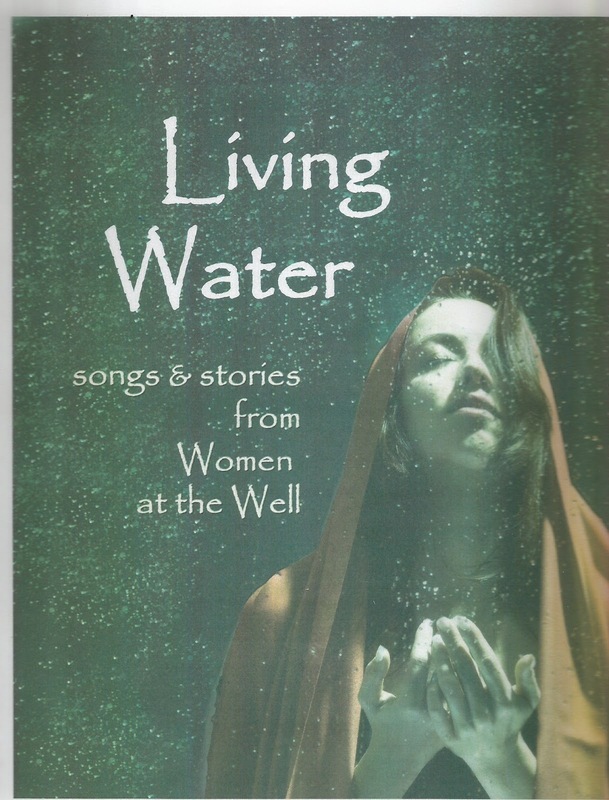 In the next edition of Living Water, Brenda hopes to include the actual music from songs included in “Women at the Well,” this musical program she regards as “a call to discipleship.” You can order the book and the CD track from samaritan woman@bellsouth.net. 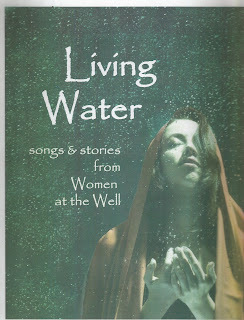 Note: Cover photo of Living Water by Engin Akyurt on Pixabay.com with modification by The Swampgoddess. Several hundred people honored Amédé Ardoin at the St. Landry Parish Visitor Center yesterday afternoon when a statue of this pioneer Creole musician, created by Sculptor Russell Whiting, was unveiled. The beautiful statue, made of carved steel in which Whiting used an oxy-gasoline torch, was inspired by the only known photograph of the talented La-La and Zydeco musician. It shows Ardoin standing on his accordion and holding a lemon that refers to the musician’s habit of carrying a lemon in his pocket to keep his high-pitched voice clear and strong. Ardoin grew up near Eunice and Mamou and often played his accordion and sang for dances as a teenager. After joining up with the fiddler Dennis McGee, he made some of the earliest recordings from Acadiana for Columbia records, a total of 30 recordings. Stories of his death vary, but the best-known version is a tragic one that tells of a summer night when Ardoin performed for a barn dance somewhere in St. Landry parish, and a white woman handed him a handkerchief to wipe the sweat from his face. Following the dance, he was beaten and run over many times by a Model A Ford driven by white men who objected to his exchange with the white woman. He was discovered lying in a ditch the following day and later admitted to the State mental hospital in Pineville, Louisiana where he died on November 3, 1942. He was buried in an unmarked grave. A woman who was standing next to me at the unveiling told me that she was attending the commemorative ceremony because she felt that the event honoring Ardoin was a form of justice, and she had come to the Visitors Center to support the cause. The speakers included former poet laureate Darrell Bourque and Patricia Cravens who were prime movers of the Amédé Ardoin Project, a project that will continue to include a scholarship initiative supporting young artists who wish to study with Louisiana La-La and Zydeco musicians. Russell Whiting says of his Ardoin commemorative that he found the photograph of Ardoin endearing and identified with him as an artist who wanted his creations to survive. Whiting began his career as a metal worker in the oil industry, and his highly original work has been exhibited throughout the U.S. in private and public sculpture gardens. Poet Bourque displayed his book, if you abandon me, comment je vas faire, An Amédé Ardoin Songbook, published by Yellow Flag Press and now in its twelfth printing. He invited the audience to donate $10 for the book, which will support the Amédé Ardoin Project and urged communities and individuals to plant a lemon tree or grove in honor of Ardoin. Information about the lemon tree project can be obtained at darrellbourque@gmail.com or patriciacravins@gmail.com. Although a few dark clouds hovered over the event, the rain did not fall on the unveiling, and Amédé Ardoin was “brought home” during a silent, respectful moment, followed by a celebratory Bal de Dimache Apres Midi. Some tree huggers I know are still hiking on wooded trails at age 82, but I have to admit that I struggle to make treks through forests at my age. I’m sure that Louisiana’s famous botanist, Caroline Dormon, who “carved trails through the woods, scooped out a reflection pond and planted hundreds of wildflowers, trees, and shrubs”* was a brisk walker until she reached at least 80, but I was sorely tested on a two-mile-trek looking for a crabapple in bloom yesterday in the Louisiana State Arboretum near Ville Platte, Louisiana. 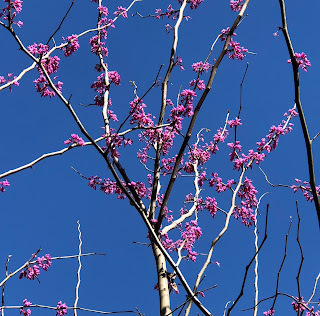 I discovered a blooming redbud for which I’d been searching, but the crabapple blossoms were too high to photograph, and we turned back on the PawPaw Loop Trail before I attempted to climb any steeper hills. 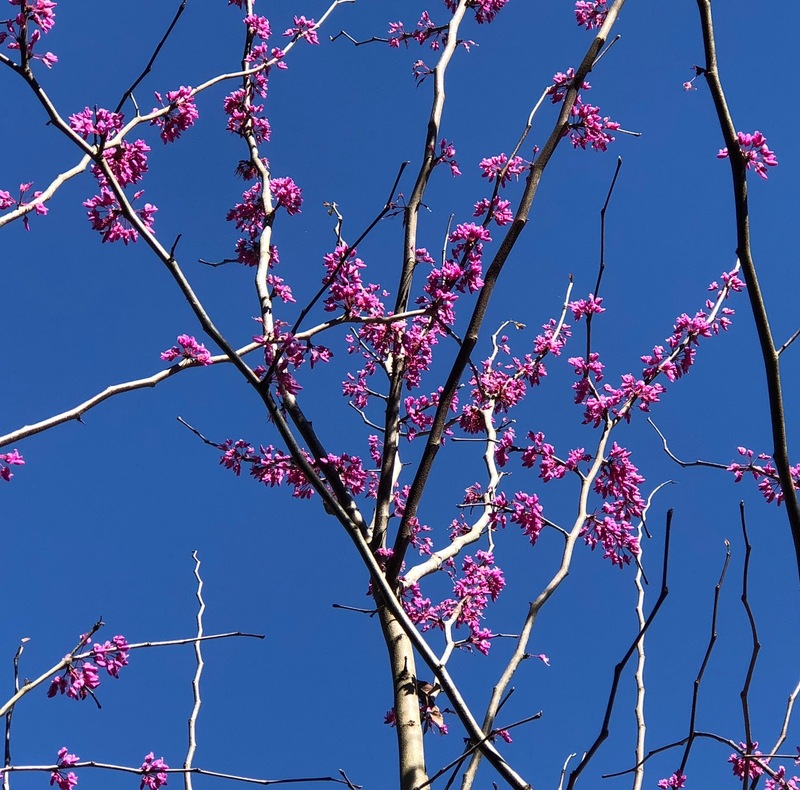 The Louisiana State Arboretum is a 600-acre preservation area of 5 1/2 miles of hiking opportunities for real hikers and covers a bottomland hardwood forest and a Beech-Magnolia Forest, and we enjoyed the hour in this nature preserve, despite my bum knee. I’m writing a book of poetry that Dr. Victoria I. Sullivan is photographing for me. She has spent the last forty years identifying trees and plants for me and always attempts to provide opportunities for me to engage in outdoor exercise. I was disappointed that I couldn’t get a photo of the crabapple and saw only a few white flower petals beneath one of the tallest crabapple I’ve glimpsed in my 82 years. In the introduction to Let the Trees Answer (the book of poetry and photos about trees) I pay tribute to my mother who loved the woods. I relate that one of her paintings showing a gnome standing beneath a tree, holding a paintbrush and palette, hung in her bedroom until the 1980’s, and that piece of art symbolized her love of woods and the mystical connection to creativity my mother certainly felt. I also pay tribute to my father who would announce a cease fire for arguments at the meal table when I was growing up by saying “Look at the trees,” pointing to the three tall pines in the backyard of our home in Franklinton, Louisiana. I wrote a lot about trees in the essay on Caroline Dormon in Their Adventurous Will, a book about memorable Louisiana women. Dormon lived on a 120-acre tract of piney woods called Briarwood near Saline, Louisiana and, according to its owner, harbored a “dark place” in its deepest parts where the devil’s snuff box grew and which Dormon would dramatically tap for naturalist visitors so that the fungus expelled a cloud of spores and impressed them with the mysteries of plant life. In the heart of the Arboretum at Chicot State Park, I could almost hear Dormon talking about hybridizing plants so they would be immortal (she believed this) and scouring the backwoods for seeds and cuttings to put in her own woods. An adventurous soul, she probably would've devised some way of climbing one of the larger trees near the crabapple I discovered so she could take a photo of the blossoms. I was happy to see that the Arboretum featured a Caroline Dormon Lodge on the Walker Branch Trail in a Beech-Magnolia Forest that contained a covered bench where visitors could sit and listen to the trees talking. Several weeks ago when l shared lunch at Dr. Mary Ann Wilson’s home in Lafayette, Louisiana, I noticed a handsome volume entitled Swamp: Nature and Culture lying on an end table in her den. “It’s a book written by my youngest son Anthony — his new swamp book,” she explained, “and is a historical, cultural, and ecological story about swamps. I think it’d interest you.” I was intrigued and spent part of our visit looking at the photography and chapter headings in the book. I ordered a copy of this intriguing volume the following day. 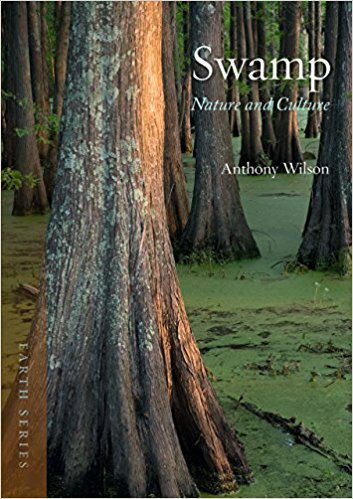 Swamp: Nature and Culture is Dr. Anthony Wilson's second book about swamps in a series called “Earth Series,” which provides readers with authoritative and interesting narratives, combining science and literature. 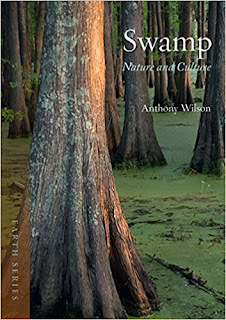 A scholar and English professor, Dr. Wilson writes in a highly accessible style, and the photographs in the series are stunning illustrations of swamp terrain, some of which were taken by the late Greg Guirard, Louisiana’s former “swamp man” who was the guru of bayou and marshlands of Louisiana’s wetland system. 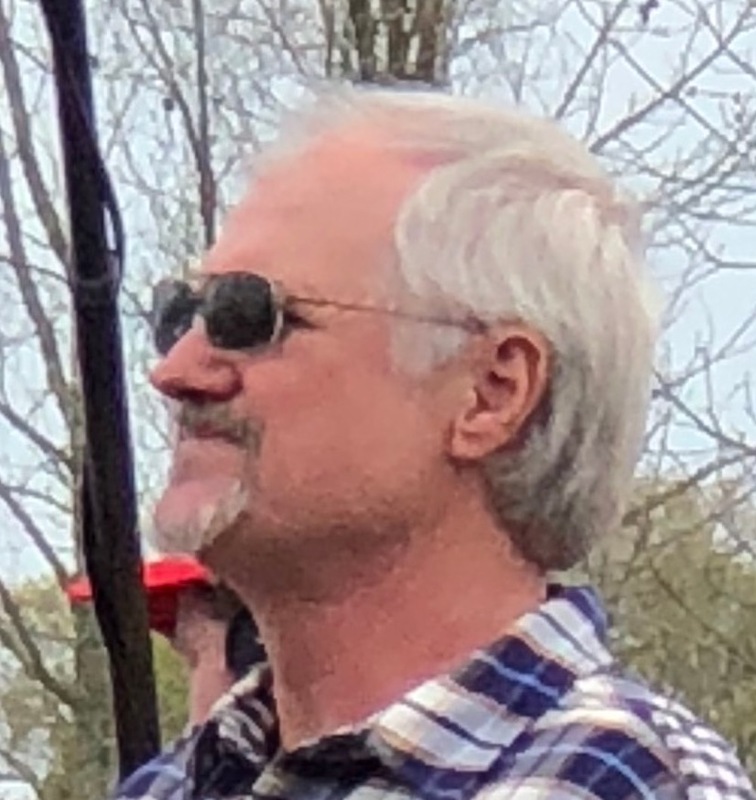 I was fascinated by the range of Dr. Anthony Wilson’s interests, but blog length requires brevity, and I’ll concentrate primarily on Louisiana wetlands that he includes in a work that spans swamp landscapes from Louisiana to the peat bogs in Russia. I know that he spent his high school years in Louisiana, and his interest in wetlands was fanned by the 10,000 square miles of the State’s swamps and marshlands. He describes the wildlife in the Atchafalaya Basin, including alligators, snakes, snapping turtles and the colorful birdlife, reminding us how our great wetlands are shrinking at the rate of 40 percent of America’s total wetlands. A glimpse of chapter headings in Swamp: Nature and Culture shows the reader the comprehensiveness of this volume. 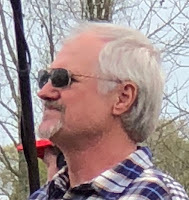 Dr. Wilson's range includes “People of the Swamp;” “Swamp as Horror: Monsters, Miasma and Menace,” “Swamp as Spectacle;” “Paradise Lost,” and includes an Appendix titled “An Array of Major World Wetlands” that will titillate the interests of biologists and environmentalists worldwide. The layperson will be intrigued by the mysteries and mythologies of swamp landscapes in which Dr. Wilson relates how the “breath” of the swamp was once regarded as the origin of sickness and death. “Underlying the various superstitions, legends, and lore about devils, witches, and supernatural terrors in the swamp was, it long seemed, a legitimate terror that could poison with a single breath…” Wilson explains that swamps actually filter pollutants from water; e.g., the water of the Great Dismal Swamp was pure as the tannins that leeched into the water from tree bark, preventing bacteria from growing, even though the water became an amber color. Dr. Wilson probes the histories of swamp monsters as portrayed in comic books and film; e.g., the “Swamp Thing,” showcasing a doctor who died in the Louisiana swamp and was enveloped in a plant body that thought it was still alive and was superhumanly strong with the ability to regenerate itself (much as the creatures in Dr. Victoria Sullivan’s book about giant Louisiana polyploids in her speculative volume, Adoption). Dr. Wilson’s book is both scholarly and accessible. His knowledge of literature illuminates the chapter on Monsters, Miasma and Menace with references to Greek mythological stories, which date back to the first or second century BC when Hercules meets his fierce foe in the swamp of Lerna: the Hydra, a nine-headed beast. Dr. Wilson also features Grendel, a character in Beowulf he considers one of literature’s earliest marsh monsters. This is a “must read” about the diverse ecosystems of our fragile wetlands, as well as a compendium of folklore, legend, and mysticism based in the beautiful, ecologically-important wetlands of Louisiana and other exotic places. Dr. Anthony Wilson is an Associate Professor of English at LaGrange College in LaGrange, Georgia and the author of Shadow and Shelter: The Swamp in Southern Culture.